A few months ago when I guest blogged on Catherine Delors' site about connections between England and France during the Napoleonic Wars, my agent commented that the way certain historical figures, such as the Duke and Duchess of Devonshire, kept popping up in my post was a sort of Regency six degrees of separation. I started thinking about the six degrees of separation idea in relation to a real historical figure who has appeared or been mentioned in a number of my books - the Devonishires' younger daughter Harriet. 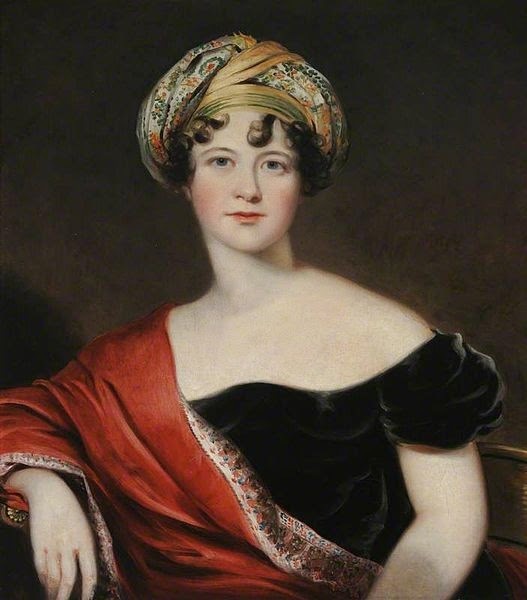 Lady Harriet Cavendish was born in 1785, the daughter of William Cavendish, 5th Duke of Devonshire, and the former Lady Georgiana Spencer, who became a celebrated society beauty and political hostess as Duchess of Devonshire. Georgiana was a strong supporter of the Whigs and their charismatic leader Charles James Fox. She had a love affair with Earl Grey, a young Whig politician who eventually became prime minister in 1830. Georgiana bore Grey a daughter, Eliza, in secret, a half-sister of Harriet's who was raised by Grey's parents. Lady Caroline Ponsonby was Harriet's first cousin, the daughter of Georgiana's sister, Henrietta, Countess of Bessborough. Caroline married William Lamb, son of the famous Whig hostess Lady Melourne. Though it began as a love match, the marriage was not happy. Caroline is probably best known to history for her love affair with Lord Byron. She dramatized the love affair in Glenarvon, a roman à clef which scandalized the ton and had them madly speculating on which character was based on which real person. After Caroline's death, William, by then Lord Melbourne became young Queen Victoria's prime minister and political mentor. William's sister Emily, Countess Cowper, was a patroness of Almack's. After her husband's death she married her longtime lover (though the love affair wasn't precisely exclusive on either side), Lord Palmerston, who later became prime minister himself. (A visiting dignitary once stumbled into an embarrassing situation by remarking on how much Palmerston's son resembled him. The young man in question was in fact officially Palmerston's stepson and the son the late Earl Cowper, though Palmerston almost certainly fathered him.). As Lady Palmerston, Emily was also a celebrated political hostess. Harriet's childhood at Devonshire House included another Caroline, Caroline St. Jules, the daughter of the Duke of Devonshire and his mistress, Lady Elizabeth Foster, who lived for many years in a menage-à-trois with the duchess. Caroline St. Jules married William Lamb's brother George (and was referred to by the family as "Caro George" to differentiate her from "Caro William"). Her marriage was not entirely tranquil either. At one point she left her husband and ran off to the Continent with Henry Brougham, a radical Whig politician who later defended Caroline of Brunswick, the Prince Regent's estranged wife, when he attempted to divorce her after he became George IV. Emily Cowper went abroad and helped persuade her sister-in-law to return to her husband. Harriet's aunt, Lady Bessborugh, had a love affair the playwright Richard Brinsley Sheridan, but the love of her life was Lord Granville Leveson-Gower, a politician and diplomat and younger son of the Marquess of Stafford. She bore him two children in secret who were placed in foster homes. In 1809, Granville's affair with Lady Bessborough had ended. Granville needed to marry and produce legitimate children. Harriet was four-and-twenty and unhappy at home. Her mother had died and her father had married his longtime mistress Elizabeth Foster. That Granville proposed to Harriet, niece of his longtime mistress, and that Harriet accepted (with her aunt's blessing) is not entirely surprising given their circumstances. That the marriage proved remarkably happy is more startling ("Granville, adored Granville, who would make a barren desert smile," Harriet wrote). They had five children and also raised the two illegitimate children he had had with Harriet's aunt. Granville became Viscount and then Earl Granville. For many years he and Harried presided over the British embassy in Paris while Granville served as ambassador. Harriet had an intriguing and seemingly quite happy life which put her within six degrees or less of a number of prominent people of the day. Do connections between real historical figures intrigue you? Writers, are have you ever found an unexpected connection between two real historical figures while researching? Do certain real historical figures keep finding their way into the pages of your books? 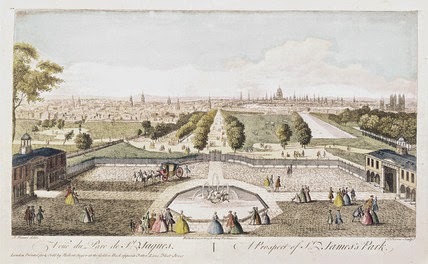 TRAVELS IN ENGLAND IN 1782: St. James’s Park. "The park is nothing more than a semicircle, formed of an alley of trees, which enclose a large green area in the middle of which is a marshy pond. The cows feed on this green turf, and their milk is sold here on the spot, quite new. In all the alleys or walks there are benches, where you may rest yourself. When you come through the Horse Guards (which is provided with several passages) into the park, on the right hand is St. James’s Palace, or the king’s place of residence, one of the meanest public buildings in London. At the lower end, quite at the extremity, is the queen’s palace, a handsome and modern building, but very much resembling a private house. As for the rest, there are generally everywhere about St. James’s Park very good houses, which is a great addition to it. There is also before the semicircle of the trees just mentioned a large vacant space, where the soldiers are exercised. How little this famous park is to be compared with our park at Berlin, I need not mention. And yet one cannot but form a high idea of St. James’s Park and other public places in London; this arises, perhaps, from their having been oftener mentioned in romances and other books than ours have. Even the squares and streets of London are more noted and better known than many of our principal towns. But what again greatly compensates for the mediocrity of this park, is the astonishing number of people who, towards evening in fine weather, resort here; our finest walks are never so full even in the midst of summer. The exquisite pleasure of mixing freely with such a concourse of people, who are for the most part well-dressed and handsome, I have experienced this evening for the first time. Before I went to the park I took another walk with my little Jacky, which did not cost me much fatigue and yet was most uncommonly interesting. I went down the little street in which I live, to the Thames nearly at the end of it, towards the left, a few steps led me to a singularly pretty terrace, planted with trees, on the very brink of the river. Here I had the most delightful prospect you can possibly imagine. Before me was the Thames with all its windings, and the stately arches of its bridges; Westminster with its venerable abbey to the right, to the left again London, with St. Paul’s, seemed to wind all along the windings of the Thames, and on the other side of the water lay Southwark, which is now also considered as part of London. Thus, from this single spot, I could nearly at one view see the whole city, at least that side of it towards the Thames. Not far from hence, in this charming quarter of the town, lived the renowned Garrick. Depend upon it I shall often visit this delightful walk during my stay in London. To-day my two Englishmen carried me to a neighbouring tavern, or rather an eating-house, where we paid a shilling each for some roast meat and a salad, giving at the same time nearly half as much to the waiter, and yet this is reckoned a cheap house, and a cheap style of living. But I believe, for the future, I shall pretty often dine at home; I have already begun this evening with my supper. I am now sitting by the fire in my own room in London. The day is nearly at an end, the first I have spent in England, and I hardly know whether I ought to call it only one day, when I reflect what a quick and varied succession of new and striking ideas have, in so short a time, passed in my mind." TRAVELS IN ENGLAND IN 1782: The Prospect of London. "We first descried it enveloped in a thick smoke or fog. St. Paul’s arose like some huge mountain above the enormous mass of smaller buildings. The Monument, a very lofty column, erected in memory of the great fire of London, exhibited to us, perhaps, chiefly on account of its immense height, apparently so disproportioned to its other dimensions (for it actually struck us as resembling rather a slender mast, towering up in immeasurable height into the clouds, than as that it really is, a stately obelisk) an unusual and singular appearance. Still we went on, and drew nearer and nearer with amazing velocity, and the surrounding objects became every moment more distinct. Westminster Abbey, the Tower, a steeple, one church, and then another, presented themselves to our view; and we could now plainly distinguish the high round chimneys on the tops of the houses, which yet seemed to us to form an innumerable number of smaller spires, or steeples. lst all along, at proper distances, the road was lined with lamp-posts. One thing, in particular, struck and surprised me not a little. This was the number of people we met riding and walking with spectacles on, among whom were many who appeared stout, healthy, and young. We were stopped at least three times at barriers or gates, here called turnpikes, to pay a duty or toll which, however small, as being generally paid in their copper coinage, in the end amounted to some shillings. Adelphi Buildings which had just afforded us so charming a prospect on Westminster Bridge. My two travelling companions, both in the ship and the post-chaise, were two young Englishmen, who living in this part of the town, obligingly offered me any assistance and services in their power, and in particular, to procure me a lodging the same day in their neighbourhood. In the streets through which we passed, I must own the houses in general struck me as if they were dark and gloomy, and yet at the same time they also struck me as prodigiously great and majestic. At that moment, I could not in my own mind compare the external view of London with that of any other city I had ever before seen. But I remember (and surely it is singular) that about five years ago, on my first entrance into Leipzig, I had the very same sensations I now felt. It is possible that the high houses, by which the streets at Leipzig are partly darkened, the great number of shops, and the crowd of people, such as till then I had never seen, might have some faint resemblance with the scene now surrounding me in London. There are everywhere leading from the Strand to the Thames, some well-built, lesser, or subordinate streets, of which the Adelphi Buildings are now by far the foremost. One district in this neighbourhood goes by the name of York Buildings, and in this lies George Street, where my two travelling companions lived. There reigns in those smaller streets towards the Thames so pleasing a calm, compared to the tumult and bustle of people, and carriages, and horses, that are constantly going up and down the Strand, that in going into one of them you can hardly help fancying yourself removed at a distance from the noise of the city, even whilst the noisiest part of it is still so near at hand. It might be about ten or eleven o’clock when we arrived here. After the two Englishmen had first given me some breakfast at their lodgings, which consisted of tea and bread and butter, they went about with me themselves, in their own neighbourhood, in search of an apartment, which they at length procured for me for sixteen shillings a week, at the house of a tailor’s widow who lived opposite to them. It was very fortunate, on other accounts, that they went with me, for equipped as I was, having neither brought clean linen nor change of clothes from my trunk, I might perhaps have found it difficult to obtain good lodgings. It was a very uncommon but pleasing sensation I experienced on being now, for the first time in my life, entirely among Englishmen: among people whose language was foreign, their manners foreign, and in a foreign climate, with whom, notwithstanding, I could converse as familiarly as though we had been educated together from our infancy. It is certainly an inestimable advantage to understand the language of the country through which you travel. I did not at first give the people I was with any reason to suspect I could speak English, but I soon found that the more I spoke, the more attention and regard I met with. I now occupy a large room in front on the ground floor, which has a carpet and mats, and is very neatly furnished; the chairs are covered with leather, and the tables are of mahogany. Adjoining to this I have another large room. I may do just as I please, and keep my own tea, coffee, bread and butter, for which purpose my landlady has given me a cupboard in my room, which locks up." I love period sources, and nothing beats a foreigner's take on a locality, as they note down all kinds of strange little observations. 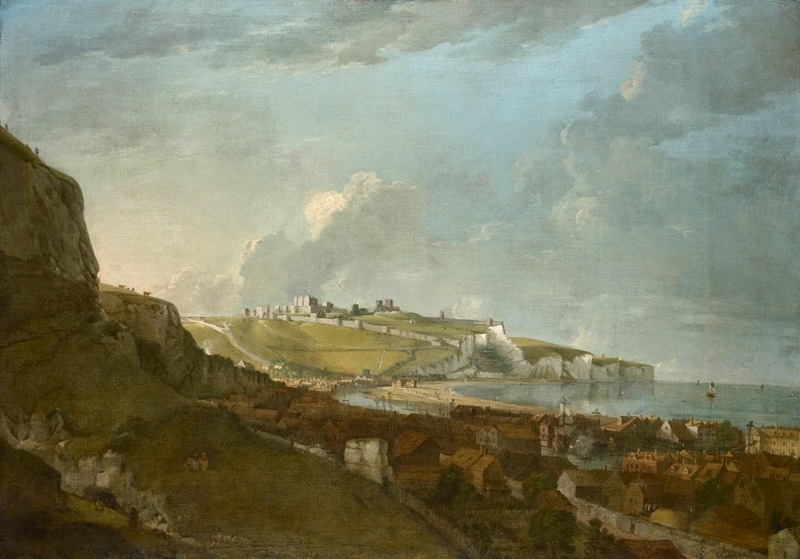 Charles P. Moritz was a German traveler, and his “Travels, chiefly on foot, through several parts of England in 1782, described in Letters to a Friend" was translated into English and published in 1795. This morning those of us who were fellow passengers together in the great cabin, being six in number, requested to be set on shore in a boat, a little before the vessel got to Dartford, which is still sixteen miles from London. This expedient is generally adopted, instead of going up the Thames, towards London, where on account of the astonishing number of ships, which are always more crowded together the nearer you approach the city, it frequently requires many days before a ship can finish her passage. He therefore who wishes to lose no time unnecessarily, and wishes also to avoid other inconveniences, such as frequent stoppages, and perhaps, some alarming dashings against other ships, prefers travelling those few miles by land in a post-chaise, which is not very expensive, especially when three join together, as three passengers pay no more than one. This indulgence is allowed by act of parliament. As we left the vessel we were honoured with a general huzza, or in the English phrase with three cheers, echoed from the German sailors of our ship. This nautical style of bidding their friends farewell our Germans have learned from the English. The cliff where we landed was white and chalky, and as the distance was not great, nor other means of conveyance at hand, we resolved to go on foot to Dartford: immediately on landing we had a pretty steep hill to climb, and that gained, we arrived at the first English village, where an uncommon neatness in the structure of the houses, which in general are built with red bricks and flat roofs, struck me with a pleasing surprise, especially when I compared them with the long, rambling, inconvenient, and singularly mean cottages of our peasants. We now continued our way through the different villages, each furnished with his staff, and thus exhibited no remote resemblance of a caravan. Some few people who met us seemed to stare at us, struck, perhaps, by the singularity of our dress, or the peculiarity of our manner of travelling. On our route we passed a wood where a troop of gipsies had taken up their abode around a fire under a tree. The country, as we continued to advance, became more and more beautiful. Naturally, perhaps, the earth is everywhere pretty much alike, but how different is it rendered by art! How different is that on which I now tread from ours, and every other spot I have ever seen. The soil is rich even to exuberance, the verdure of the trees and hedges, in short the whole of this paradisaical region is without a parallel! The roads too are incomparable; I am astonished how they have got them so firm and solid; every step I took I felt, and was conscious it was English ground on which I trod. We breakfasted at Dartford. Here, for the first time, I saw an English soldier, in his red uniform, his hair cut short and combed back on his forehead, so as to afford a full view of his fine, broad, manly face. Here too I first saw (what I deemed a true English fight) in the street, two boys boxing. Our little party now separated, and got into two post-chaises, each of which hold three persons, though it must be owned three cannot sit quite so commodiously in these chaises as two: the hire of a post-chaise is a shilling for every English mile. They may be compared to our extra posts, because they are to be had at all times. But these carriages are very neat and lightly built, so that you hardly perceive their motion as they roll along these firm smooth roads; they have windows in front, and on both sides. The horses are generally good, and the postillions particularly smart and active, and always ride on a full trot. The one we had wore his hair cut short, a round hat, and a brown jacket of tolerable fine cloth, with a nosegay in his bosom. Now and then, when he drove very hard, he looked round, and with a smile seemed to solicit our approbation. A thousand charming spots, and beautiful landscapes, on which my eye would long have dwelt with rapture, were now rapidly passed with the speed of an arrow. Our road appeared to be undulatory, and our journey, like the journey of life, seemed to be a pretty regular alternation of up hill and down, and here and there it was diversified with copses and woods; the majestic Thames every now and then, like a little forest of masts, rising to our view, and anon losing itself among the delightful towns and villages. The amazing large signs which at the entrance of villages hang in the middle of the street, being fastened to large beams, which are extended across the street from one house to another opposite to it, particularly struck me; these sign-posts have the appearance of gates or of gateways, for which I at first took them, but the whole apparatus, unnecessarily large as it seems to be, is intended for nothing more than to tell the inquisitive traveller that there is an inn. At length, stunned as it were by this constant rapid succession of interesting objects to engage our attention, we arrived at Greenwich nearly in a state of stupefaction." I know authors who’ve caught flack for using nicknames for their heroes (sometimes quite outlandish sounding ones), but I’m here to tell you that nothing could be more historically accurate—or more English!—than a nickname; the crazier the better! Let us take for example the 5th Duke of Devonshire and his family. The Duchess and his mistress, Lady Elizabeth Foster called him “Canis” because he was happiest at home with his dogs. Amongst themselves the duchess was Mrs. Rat and Lady Elizabeth Foster was Racky. Their children were Hart (Marquess of Hartington), Little G or just G (Georgiana) and Hary-o (Harriet). At this point, it was rare for the eldest son to be sent to school (a big author I know says she's never found any Georgian/Regency first born sons with a school record), but school days were a great source of nicknames for younger sons and for first born sons from the Victorian period on. Most were either based upon your name, your title, or upon some physical quirk or deed/stunt. Just look at the characters in P.G. Wodehouse’s works: Plug, Fruity, Beefy, Puffy, Mustard, Nobby, Bicky, Chuffy, Gussie, Boko, Tuppy, Kipper, Bingo, Stinker, Buffy, Stiffy, Catsmeant, Corky, Sippy, Rocky, Sandy, Gazeka, Looney, Spennie, Flick, Hash, Chimp, Soapy, Smooth, and my favorite, Stilton. Sometimes the names make sense, e.g. Stilton’s surname is Cheesewright, Mustard’s is Pott and Kipper’s is Herring. Often it’s simple a play on their name, Sandy/Alexandra, Gussie/Augustus, Aggie/Niagra. Occasionally, they’re explained by the character’s physical description, e.g. Beefy is a big, brawny man, and sometimes we can guess, as with Stinker (aka Lord Tilbury). Many of them however are inexplicable (Bingo, Hash, and Boko? ), but because they’re so grounded in the world, you never question that there IS a reason/story behind the name. Wodehouse himself was called Plum by the way. A few strange real life ones: Jerry Lewis was “Id” (short for Idiot). Sally Struthers’s sister called her Packy (short for Pachyderm because she was chubby). Gordon Summers is better known as Sting because of a black and yellow sweater he wore. Buster Keaton was so dubbed by Harry Houdini himself because of his ability to fall down a flight of stairs and come out unscathed. So if we just play with Devonshire … He could have been D, Devon, Dray if late Victorian (a play on Shire, which is a horse breed), he could also be Hart (as indeed the 6th Duke was), and perhaps Cup or Tankard or Bowl as a play on the “dish” part of Cavendish. So yeah, those outlandish nicknames writers give their heroes? Totally period and very, very English. 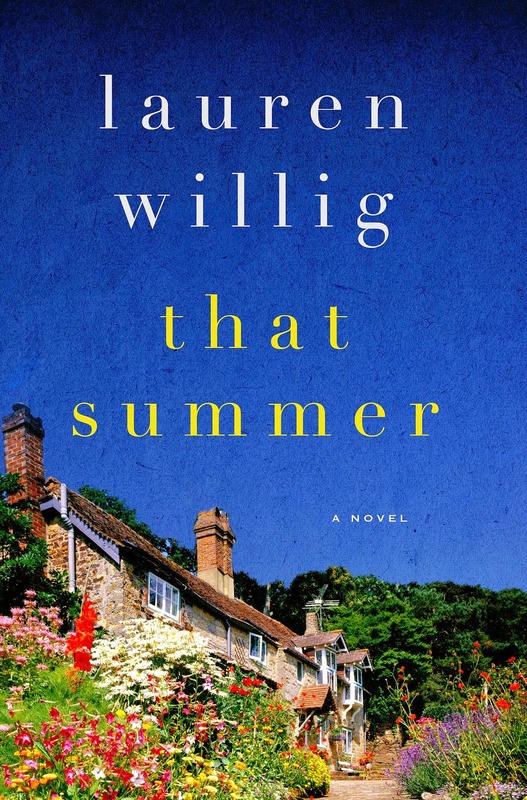 I love rooting novels in real events, plunking my imaginary characters down among genuine historical figures, the more idiosyncratic the better. A major scene in That Summer is set at the prestigious Private View at the Royal Academy Exhibition of 1849, where my historical hero, Gavin Thorne, is showing his painting, Mariana in the Moated Grange. Want to see some of what my heroine would have seen? Shall we open it up and take a look? In the meantime, William Holman Hunt exhibited Rienzi, or, more volubly, Rienzi vowing to obtain justice for the death of his young brother, slain in a skirmish between the Colonna and the Orsini factions, a history painting about the fourteenth century Roman folk hero, Cola di Rienzo. But where, you may ask, was that most iconic of them all, Dante Gabriel Rossetti? Much to the annoyance of his friends, he had taken himself and his Girlhood of Mary Virgin off to the Free Exhibition at Hyde Park Corner rather than waiting for the RA show in May-- possibly because he was afraid that he wouldn't get a good placement in the RA show. You can play a fun game of "spot the PRB" in each of these paintings. For example, it's hidden on the bench on which Lorenzo and Isabella are sitting in Millais's painting. You can also play "spot the painter", since, to save the cost of models, the artists all sat for each other. And, for my fellow Goblin Market fans, that's Christina Rossetti as the title role in Rossetti's painting of The Girlhood of Mary Virgin. The Royal Academy Exhibition was the big debut of the Pre-Raphaelite Brotherhood-- so I couldn't resist having my imaginary Pre-Raphaelite, Gavin Thorne, be a part of it. For my fellow Pre-Raph fans, there's a big exhibit up at the Metropolitan Museum in New York right now! My recent trip to the Romantic Times Book Reviews Convention in New Orleans gave me time to delve into my monstrous TBR and pull out a few books I’ve been itching to get to. And while I mostly enjoyed them, there were several issues with proper forms of address that drove me batty. I’m going to quote Laura A. Wallace’s fabulous website in order to lay this stuff out. Personally, I do a quick check on how to address my characters before every book, but it’s so damn easy to forget just where on the peerage ladder Lord Christian Name becomes plain old Mr. Surname. But the most common errors I see repeated frequently are how to address/refer to a duke, a baron, and a duke or marquess’s younger son’s wife. I always think of Sayers’s marvelous Lord Peter Wimsey novels. As the younger son of a duke, he’s Lord Peter, and Harriet Vane, after she marries Lord Peter ,is LADY PETER (or Lady Peter Wimsey if being formally announced or in correspondence). She is NOT Lady Harriet Wimsey, Lady Wimsey, or Lady Harriet. Barons, unlike dukes, are NOT addressed as “baron” and unlike earls they are NOT addressed or referred as The Baron of Blank. When playing with barons, keep Lord Byron in mind (have you ever seen him referred to as Baron Byron? No? There’s a reason for that!). Barons (and baronesses) are simply Lord/Lady Title (which may or may not also be their last name). If there are multiple barons of the same last name (and yes, this was not uncommon) then in formal address you would add the “of Place”. Thus, to again quote Laura Wallace, Baron Featherstone (surname Stanley) is addressed simply as My Lord, Lord Featherstone, or more familiarly Featherstone. The ONLY exception to this is a baroness in her own right (but not the mere wife of a baron), who may be properly addressed as Baroness Featherstone as well as Lady Featherstone. 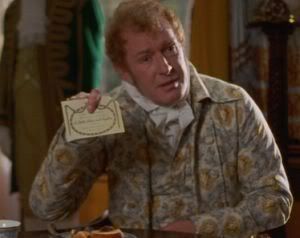 Think of Sir Walter in Persuasion. He’s formally announced as Sir Walter Elliot. He’s addressed as Sir Walter*. He is never Lord Elliot, even though his wife is Lady Elliot. Confusing, I know, but that’s just how it is. *Thanks to Sunita for the save!